A few months back, I was playing around with integrating old bridge designs with tables. I searched around the net, found lots of great bridge pictures and found a couple of great blacksmiths. Interestingly, rivets, once the mainstay of metal joinery, went out with advent welding. There’s only a handful of people in the United States still doing hot metal rivets. A couple of the blacksmith / rivet guys worth noting are Doug Lockhart of The Makers of Hand Forged Iron in logan Ohio and Steve Howell from Ballard Forge in Seattle, Washington. For old bridge restoration in particular, Vern Mesler has a great site as well —VJM Metal Craftsman. But, I digress. As I started to talk with Steve Howell, he showed me some pictures of some metal straps that he had done in the past. They were styled off of the work by Greene and Green Architects (see the Gamble House). When I saw the metal straps, I was thrilled. I instantly knew that these would make wonderful straps for fireplace mantels. I sent over a couple of 5in x 6in x 6ft reclaimed oak beams that had been joined together, sanded, and finished. The oak has a wonderful natural patina. Steve went to work and added these great straps and triangular pins. They are hand-forged and hand worked. This is the real thing. It’s not synthetic, mass produced, run of the mill metal. Each piece has character and texture and Steve’s signature. They are a piece of art. As the pictures of the finished piece came in, I could not have been more excited. This is a stunning mantel. More mantel ironwork is shown in our mantel section. This is a just great piece of work. By strapping beams together in this fashion, we can come up with some very large mantels. Custom sizes and piece are available. Stay tuned. I’m looking forward to working with both Steve and Doug in the future. The old wood and the old iron really work well together. There will be more mantel and table collaborations to come! 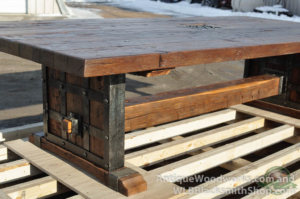 Kevin has owned and operated Antique Woodworks since 2004. He works works both behind the computer screen and phone as well as hands-on selecting, cutting, and sanding this old wood. He's also the guy who does the drawing and designing of our final products. 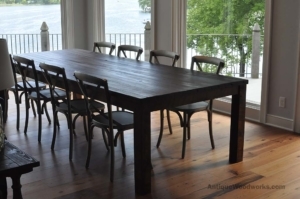 Finally, he brings a passion for history, beauty, and authenticity in all that's done at Antique Woodworks. Prior to starting Antique Woodworks, Kevin worked in the computer science and marketing fields. In consultant roles, he worked on major websites including Half.com (an eBay subsidary), Childrens Place, 3M, Lab Safety and others. He was one of the early pioneers developing websites as far back as 1996.